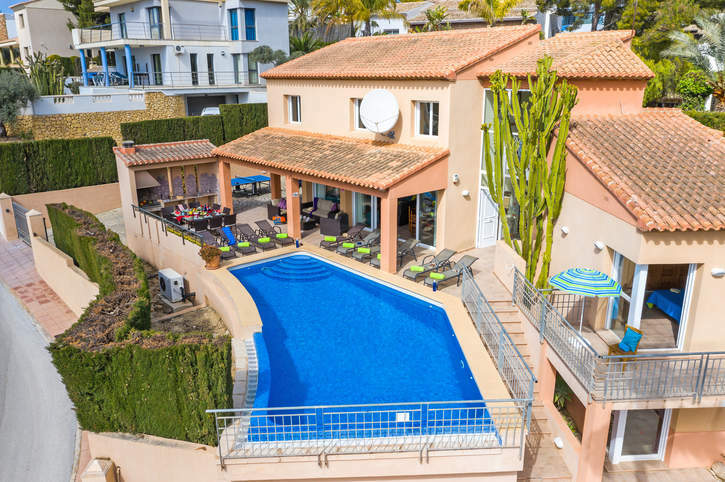 Villa Mar Flores is superbly located in the El Portet area of Moraira within 15 minutes' walk to the beach and marina, which is a special place to sit and dine, whilst overlooking the boats. The centre of Moraira is a little further on with plenty of places to eat, drink and shop. This 5 bedroom villa has a large private pool, a great BBQ house and spacious living accommodation. WiFi, pool heating and air conditioning/heating in the bedrooms and lounge are included. Within strolling distance to either El Portet Beach or the marina in the other direction. Large private pool too! The large private, infinity pool takes pride of place where you can cool off from the Spanish sun in between relaxing on one of the sun loungers. There is a BBQ house to one side, along with a large table and chairs for alfresco dining. The off-road parking area with space for several cars is located behind the villa gates. You access the villa by the front door near the pool which opens into the hallway. The open plan lounge is flooded with plenty of light from the windows and patio doors which also allow direct access to the pool terrace. It is comfortably furnished with a seating area one end and a table and chairs for entertaining your party to the other. The fully equipped kitchen is adjacent with access to a utility room. On the ground floor, there's a double bedroom with an en suite bathroom and access to a private terrace with views towards the sea. Upstairs, you'll find 3 twin bedrooms with sea views, as well as a separate bathroom and WC. The remaining bedroom - a twin with en suite bathroom and its own patio - is on the lower floor. This villa is registered and licenced by the Generalitat Valenciana to comply with local legislation on holiday rentals. This number is: AT-441252-A. This villa is within walking distance to both El Portet Beach and the main hub of Moraira Village passing by the marina on route. You can find something to suit all tastes in Moraira from fine dining, to a day out relaxing on one of the sandy beaches. The marina at the end of the high street, is a special place to dine overlooking the water. In the summer fiestas are held with costumes, battles and spectacular fireworks. There is a supermarket less than 10 minutes' walk away for your holiday essentials. There is a weekly market in the centre of Moraira every Friday morning, offering everything from fruit and vegetables to handbags, clothes, toys and more. The centre of the village has plenty of shops to browse. The blue flag beach of El Portet is just ¾ mile from Villa Mar Flores with some good quality restaurants along the promenade. L'Ampolla is the main large beach which is near the resort centre with an alfresco snack bar right on the sand. Just behind the beach is a natural water outlet with plenty of protected wildlife from ducks to turtles. In the heart of Moraira you'll find a great variety of cuisine, bars and a small nightclub which is partially open air. There are plenty more restaurants that sit on the edge of the sea ranging from snacks on the beach to some very prestigious restaurants in El Portet. Or why not treat yourself at one of the waterfront eateries in the beautiful marina? There is something for everyone at Moraira, from a mini fun fair to paddle tennis, as well as go-karting for the racing fans. Alternatively, take a trip to Benidorm where there is a theme park and a couple of water parks along with all that this lively resort offers. There is a small castle on the water's edge in the centre of the resort of Moraira. You could take a drive into Calpe with its famous Penon de Ifach Rock. There are also many seafood dishes on offer along the promenade or tapas down the lanes of the old town. If you want to go further afield, a trip to Alicante or Valencia is well worth the visit. The Science and Art buildings in Valencia are a great experience. Villa Mar Flores is not available to book for season as it is sold out. Take a look here at the Costa Blanca villas that are currently on sale. The beaches are the star of the show here, with golden sand, calm clear water and plenty of choice. You can head for Platgetes if you enjoy snorkelling - there are quiet hidden coves with plenty of rocks and outcrops to explore. If you have young children, L’Ampolla, a man-made beach, is ideal as the sand gently shelves into the sparkling blue water, perfect for small people to paddle and play. If you enjoy a challenge there are various water sports on offer, such as paragliding, water skiing and scuba diving. If you prefer to stay dry, there is excellent golfing around here as well as go-karting! The prettiest beach is also the smallest, a hidden gem called El Portet, by the marina. You get to this gorgeous, idyllic spot along a winding road, just 5 minutes’ drive from the town and it has a few bars and restaurants to keep you refreshed and well fed.~ Moraira is full of stylish cafes, there’s almost no need to eat at your villa, bars and restaurants allow you to enjoy fish and shellfish caught that morning as well as traditional tapas alongside fish and chips, curry and pizza. If you are feeling bold try the octopus stew or rice blackened in squid ink! The main fish restaurants overlook the small port and fish market. The town is not a chilled out place at night but there is live music in one or two bars and a small nightclub. You can also watch a traditional flamenco performance if you are in the mood. Moraira is small, compact and easy to get around, which maybe one of the reasons for its huge popularity as a retirement town for expats, especially the British. At the heart of the Costa Blanca, the town is dominated by the towering Penon de Ifach rock, now designated a national park, is often used as a symbol of the Costa Blanca. The summit can be reached via a tunnel and offers panoramic views along the coast and on a clear day, to Ibiza some 60 miles away. Calpe has a wonderful mixture of old Valencian culture and modern tourist trappings, with three of the most beautiful sandy beaches on the coast. Calpe is a town rich in history and culture and its strategic position on the coast has attracted many voyagers and settlers throughout history. The cobbled stones of the old town lead to a modern amphitheatre with displays and shows during the summer evenings.